Kanjak Ashtami puja is an important ritual during the Chaitra Navratri or Vasant Navratras. It falls on the eighth day – the Ashtami day – of the nine-day Navratri festival. A young girl child (Kanjaks) is worshipped on this day in North India. In 2012, the date of Kanjak Ashtami is marked on March 31. 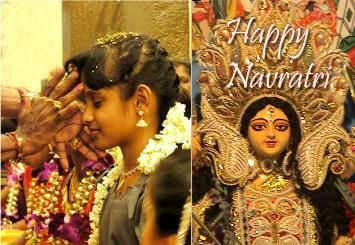 The Navratri commences on the first day (pratipada) of the bright fortnight of the lunar month of Ashwin. The festival is celebrated for nine nights once every year during the beginning of October, although as the dates of the festival are determined according to the lunar calendar, the festival may be held for a day more or a day less. The Durga prayers include selected Sholokas of Durga Saptashudi which are called Saptashaloki Durga and are recited by devotees daily. On the eighth day, regarded as "Ashtami", most of the Hindus perform "Kanjak" in which they carry out pooja and hold a seating for girls (mainly seven in number) who they consider Goddess (Maa) in disguise. Their feet are washed as a mark of respect for the Goddess and then they are offered new clothes as gifts by the worshipper. This ritual is performed in most parts of the country. Another important ritual of this festival is Shastra Ayudhi Puja wherein the most important article of the household is worshipped. In earlier days, the soldiers used to worship their weapons on this day. The ninth day, which is called Ram Navmi, is again a day of traditional celebrations. On this day, havans are performed especially at temples dedicated to Lord Rama. Some of the Hindus also sow barley in a pot on first day of Navratra and keep it at a sacred place, they water it daily and offer prayers. The household keeps fast and taking meals one time only. On the ninth day, the barley plants are kept for display of the devotees as a symbolic image of Goddess Durga. These plants are later immersed in rivers. A good growth of plants symbolizes the acceptance of prayers by Goddess Durga and her happiness, which is sure to bring happiness and prosperity to those involved. Navaratri is taken as a period of fasting. In Gujarat, the evenings and nights are occasions for the fascinating Garba dance. The women dance around an earthen lamp wherein centric goddess Durga is placed, all of them including males sing devotional songs accompanied by rhythmic clapping of hands. Garba is sign of happiness and relief from the demon, which was expressed in the earlier times by the people. Clapping is the form of thanking and giving gratitude to goddess Durga, as she had saved the entire world from the atrocities of the Mahisasur. as it is celebrated in the month of September/October is the period when Goddesses Durga, Laxmi and Sarawati did penance sitting on a needle to get enough strength to slay the demon Mahisuran, who was causing havoc to everyone. It is said that finally on Vijaydasami Day they were able to get victory by slaying him that signifies the importance given to this day as important to start learning any art, study or any new venture. Kanjak is a ritual that is carried on either on Ashtami/Navami day in both Navaratris, after a 7/8 days fast with eating only restricted foods and abstaining from eating non-vegetarian foods, abstaining from alcohol and smoking at times. With a purity of mind and spirit, it is on this day that puri, halwa, chana and subji are prepared and young girls that have not attained puberty are given a feast.
. Kumari, or Kumari Devi in Nepal . koonj - a migratory bird of cold regions resembling a crane. 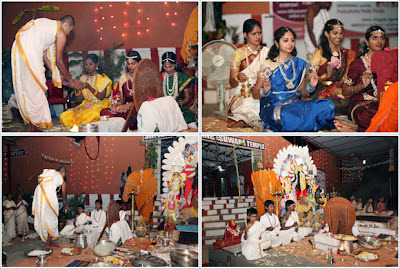 Kumari puja is done to a girl child treating her as Goddess. She is presented gifts as per the child's wish. Kanya puja or Kanjak Ashtami Puja, it is offered to young girls who are considered to be the living incarnations of Goddess Durga are worshipped on the day. ***** . Month of Sawan (savan) and Rain .
. Durga and Mother Godesses .